Ok... So some of the accessories are already sold out. If there is anything you want, e-mail me asap before the items you want get sold out. Here is the latest list from my website. If you have problems opening it from there, click here to get to my website and access it from there. I am heading to Convention! I can't even believe that tomorrow I am leaving for Salt Lake City. The Stampin' Up! Convention is starting in less than 2 days. I am really excited! I will even try to send some updates for you and post some new stuff! Until then, I thought I would share a card with you. I think this is one of my favorite cards that I have made with the new stuff. This is a really simple card, but the Bella Rosa paper is just so beautiful. It makes it easy to make the simple, beautiful cards. The base of this card is Red Riding Hood Red. I punched the bottom with the new scallop edge punch. I layered a piece of Bella Rosa paper on top. I also punched a scrap of the Bella Rosa paper with the scallop edge punch and layered that under the scallops of the card. Next, I tied the 5/8" Chocolate Chip grosgrain ribbon around a small piece of Old Olive ribbon and wrapped it around the card. Finally, I stamped the sentiment from the Heard from the Heart set in Red Riding Hood Red and then again in Whisper White. See you in the next few days with some sneak peeks!! This is a sample of the new set Dream Du Jour. It was inspired by Cindy Lawrence from a sample she posted on her blog using these colors. My card base is Kiwi Kiss. The chocolate chip polka dot paper is from the Bella Rose DSP. Next, I used my cuttlebug on a piece of Baja Breeze and made the Paisley print. I layered that with Taken with Teal (This is where Cindy really came in - I would never have thought to add that color here!). 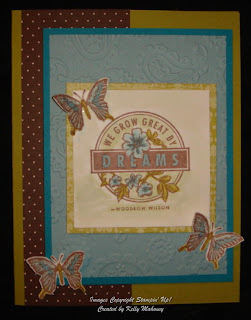 Finally I watercolored the butterflies and "Dreams" pieces after stamping them with Basic Brown ink on Whisper White. I layered that piece with another piece of Bella Rose DSP. I was really happy with this card. It was a little out the box for me. But, sometimes, I think we all need to go out of our comfort zone! Ok... 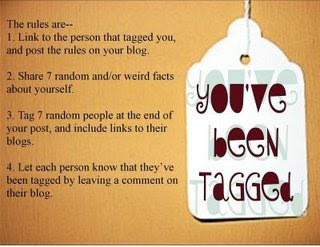 SO for only having a blog for a short time, it did not take long for someone to tag me. I am honored to have been tagged by MJ over at Technostamper. 1. I am a huge New York Yankees fan!! I was just at the game on Friday for my birthday! 2. After much protesting that I did not like country music, my mom got me into it and now I a country music junkie! In fact, I was stalking ITunes for the new Sugarland cd to be available! 4. My favorite food is pasta of any kind. 5. My wedding song was Truly, Madly, Deeply by Savage Garden. 6. I like to cook and try new recipes. Lately there have been more martini and sangria recipes than real food.... but ya know, everybody has their vices. Mine are stamping and really good drinks. 7. I love to go out with my Girls' Night Out Buddies. We have a great time and it really helps keep us all sane for the rest of lifes craziness!! Pam at Pam's Stampin' and Scrappin' Patch! Laura, Lily, Mena and Sandy at Stamp Till Dawn! Retiring Accessories List plus some at 25%off!! Here is this week's color challenge. The colors this week were Real Red, Old Olive and Very Vanilla. The theme could be Christmas in July, but I was not in a Christmasy mood yesterday. SO I went for something else. I used the Retiring set Polka Dots and Paisley. My card base is Very Vanilla. On the Real Red layer, I used the Vanilla Double technique. Basically, to do this technique, you stamp a solid image, tone on tone all over your cs. Then you stamp the outline image in Vanilla craft ink. Both images are randomly stamped all over the CS. Be sure to let it dry. Here I do not recommend heat setting. Sometimes with the Vanilla ink, the heat setting can fade the color. For the focal point of the card, I simply stamped the sentiment in Real Red and the flower in Old Olive. Then, I added a line of Sticky Strip down the left hand side of the CS and covered it with micro beads. They are hard to photograph, but look really sparkly in the pic. In person, they give the card a nice texture. When I first finished this card, I thought it was a little too simple, but after staring at it for awhile on my desk it really started to grow on me and I felt like it didn't need anything else. Give this challenge a try and let me see what you come up with. Christmas in July?? or something else?? Well, last week, my husband and I celebrated our 10th Anniversary. I can't believe 10 years has gone so fast. I wanted to make him a special card. One of our very favorite vacations was when we went to Sandals in Jamaica! It was amazing. So that was the inspiration for this card. 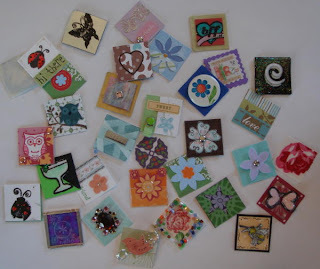 Have you seen the beautiful cards that Michelle Zindorf makes?? Well, thankfully she posts tutorials for her cards to help the rest of us try to re-create some of the things she makes. That was the second part of the inspiration behind this card. First, I used Post-its to mask the bottom half of the card. I then punched out a circle to mask the moon. I brayered on Soft Sky ink. Next, I went over it with a little Tempting Turquoise. Then, I sponged on some Brocade blue, and Night of Navy around the edges. Finally, I spoged some White craft ink to make some clouds. For the bottom, I reversed the mask and brayered Cool Carribean and Bashful Blue. I also sponged a little Brocade Blue. 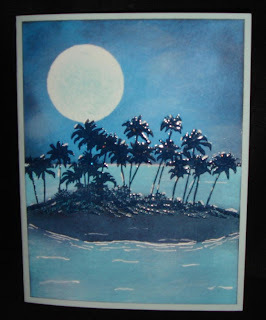 Next, I stamped the island (stamp by Stampscapes) in Night of Navy craft ink and embossed it with clear EP. I wanted the island to be a little bigger, so I cut a rounded shape from my mask and sponged heavily with Night of Navy. Last but not least, I added some highlights with the white gel pen and sponged a little Brocade Blue over the moon so that it was not so stark white. I hope you enjoy it! I was really very happy with how it came out!! I did another Technostamper sketch challenge this week. This is number 25. This one was tough. I had the idea and then when I started putting it togehter I didn't know if I could go through with it. I mean 8 buttons on one card??! Are you Kidding??? I don't think I can! I am a hoarder of my embellishments.... I think I can. I think I can! Ok so here it is with all 8 buttons! The card base is made with Pink Pirouette. I then added the strip of Baja Breeze on the right. That one is 2 3/4" x 5 1/2". I sponged around that piece to add a little dimension. The bottom piece is Red Riding Hood Red. I stamped the butterfly in Red Riding Hood Red ink. That piece measures 1 1/2"x2 3/4". For the main image, I stamped it in Basic Gray ink. Then I watercolored it with my aqua painter and classic pads in Red Riding Hood Red, Baja Breeze, Kiwi Kiss, Pink Pirouette and So Saffron. I sponged that with a litte Red Reiding Hood Red and popped it up on Dimensionals. Last but not least, I attached the buttons with mini glue dots. The buttons are from the new Button Bouquet set coming out in August. Enjoy it and be sure to check out TechnoStamper for more sketch players! Here is my card for this week's color challenge. The colors were Real Red, So Saffron and Tempting Turquoise. I really had a hard time deciding what to do.... So, I went with something I had already done. I copied the design of this Thank You card and used this week's colors. I think it was the So Saffron that was really throwing me. However, I am happy with the way it came out. I even gave it away already. To make this card, I started with a Tempting Turquoise card. I layered it with a Real Red layer. 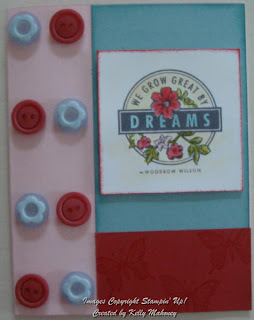 I stamped the flowers in Real Red, Tempting Turquoise and So Saffron on Whisper White and layered that on the card. Next I put a strip of Turquoise across the middle(it is 3/4" wide). Finally, I colored the Happy birthdya circle stamp with my Real Red and Tempting Turquoise markers. I punched it out with the 1 1/4" circle punch. Next, I punched out a 1 3/8" real red circle. I added the turquoise brad and popped it up with a Dimensional. The best part about this type of card is that it will work with just about any color combo and many stamp sets. Give it a try and send me your pics!! I would love to see what you come up with! I just got some of the new Decor Elements. It took me awhile to decide which ones I wanted and where I was going to put them. 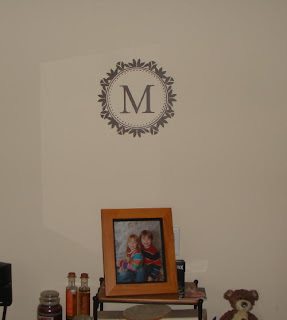 So I finally decided on the circle frame and an M for my initial to put in my dining room. Here it is! The "M" in this picture looks lighter than the frame, but it really isn't it. Here is another picture to try to give you some idea of the size. The picture in the frame below is an 8x10. The circle is about 13" in diameter. I have to say they were pretty easy to put up! The only problem I had was that for the first step, you have to rub the back to transfer the design to the transfer sheet. Well, the little dots did not want to trasnfer. I had to keep rubbing them. I thought I was going to rub through the backing paper. But after finally getting it to transfer correctly, it went up on the wall without a problem at all. 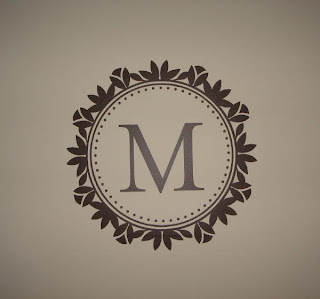 The "M" was also much easier to get to transfer to the transfer sheet. Sock Monkey, Wow Flowers and More! Hi All, I hope you are all enjoying the 4th of July Weekend. As you can see, I got to play with some new stuff. So, in my book, that is a good weekend! The card above is made with the new set Sock Monkey. Isn't he just the cutest thing ever? 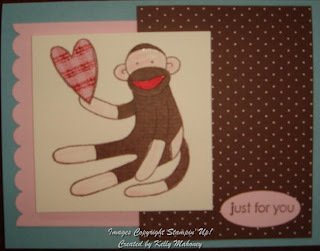 For this card, I stamped the monkey in Basic Brown ink on Very Vanilla cs. I also stamped him on a piece of the paper in the new Bella Rosa DSP pack. I cut out parts of his body from the DSP and paper pieced him together. Then I used a blender pen to color in his hands, feet and tail and face with Pink Pirouette and his mouth with Red Riding Hood Red (both new In-Colors). I also stamped the heart in Basic Brown on the Vanilla and on the DSP. Again, I paper pieced the heart. For the card base, I used a piece of Baja Breeze cs. Next, I punched a piece of Pink Pirouette with the new scallop edge punch and attached that to the card. On the right is another piece of DSP from the Bella Rosa pack. Finally, i popped up the monkey with Dimensionals. 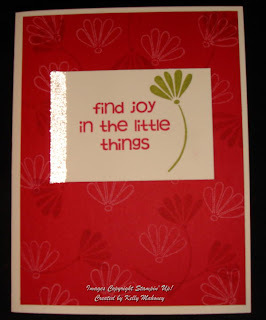 Last but not least, I stamped the "Just for you" in basic brown and punched it out with the small oval. This card also goes with the sketch challenge over at SCS. Next, this card was made with the new Wow Flowers set! The card base is Pacific Point. The layer is Very Vanilla which is stamped with the flower in Pcific Point, Kiwi Kiss and Tangerine Tango. Then, I placed a strip of Pacific Point across the center. 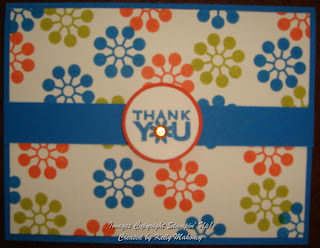 I stamped the Thank you in Pacific Point and punched it out with the 1 1/4" circle punch. Layered that on a Tangerine Tango 1 3/8" circle. I also added a rhinestone from one of the Fire circle brads. I just popped the rhinestone part out of the brad. That circle is popped up with Dimensionals. I have to be honest and tell you that when I first saw the new In-Colors, I thought that they seemed to close to other colors that we have. However, seeing them in person and using them, I have changed my mind. I really like them. They are still close to some colors we have already, but some are softer while others more bold. I think I am really going to enjoy playing with them this year! So I had been eyeing a Bind it all machine for awhile and well. I finally broke down and purchased one! I am so glad I did! While checking out some other blogs, I found this post by Patty Bennet on her blog. She made this adorable book. I knew I had to make one too! So I broke out some paper and envelopes and some rub-ons and a few hours later. Here is what I ended up with! For now, there is nothing on the pull-out pages. I figured I wpould use those for journaling once I get some pics in here. Isn't it the cutest thing? Want to make one? Let me know and I will try to put a class or a kit together! So one day a few weeks ago, my sister in law, Christin, calls me and says, "what do you know about inchies? " I reply, "I don't know. Are they a line of little stamps or something?" She says, "No, they are one inch little pieces of art that you decorate and can trade like ATC's. And, we are going to start making them. So check them out!" "Ok, I will." Well that little conversation has led us to this. Christin has started an obsession. We have even gotten my Grandma in on it. So, now we are making these tiny litle pieces of art and trading them between us. Actually, we just make 3 of each and give them each other because none of us can bear to part with the ones we have made. The biggest challenge is deciding what to do on a little one inch square. I think we are doing pretty well so far. Give them a try yourself and let me see what you come up with! ALL NEW STAMP SETS ARE GOING TO BE DIE-CUT!!!! Oh My Goodness that is so exciting! Stampin' Up! just announced that with the new catalog coming in August, all of the new stamp sets will be die-cut! That will save so much time when mounting your new stamps!! Also, today the new product line is available for purchase. The Decor Elements are self adhesive vinyl wall decorations. They are easy to apply and come with great instructions. The possibilities are endless! Check them out here! Ok, so here is my card for this week's color challenge. The colors are Rose Red (I think I said Ruby Red in an earlier post), Night of Navy and Brocade Blue. Now, I often use Beate's sketch challenge, but she is taking the summer off. SO, I needed a new sketch challenge to use too!!! So I decided to play with MJ at Technostamper and her Monday lunchtime sketch. Check it out here! For this card, I used Brocade Blue as my card base. The strip of Night of Navy is wheeled with the Classic Stars Jumbo Wheel in Night of Navy Ink. Next, I added The Rose Red 2.5" square and the Brocade Blue 2" square. Those are popped up on Dimensionals. 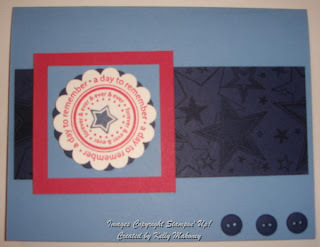 I stamped "a day to remeber" stamp from Sweet Celebrations in Rose red and the star in the middle in Night of Navy. Finally punched that out with the scallop punch. I punched another scallop punch from Night of Navy and layered those together. Popped them up with Dimensionals and last but not least the three buttons on the bottom of the card were added with mini glue dots. 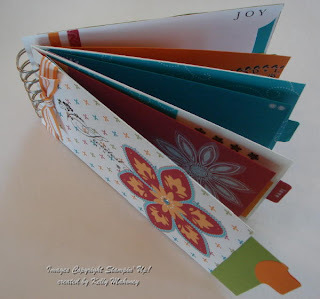 To see some more samples with this color combo, check out the blogs of Stasia, Colleen, and Tracy. I will post links to more samples as others post them. A Special Card! and a Special Sale! 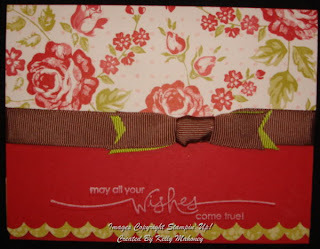 This card is one that I submitted to Stampin' Up! to apply to be a convention display stamper. Although I wasn't chosen, I was glad that I made some projects and actually submitted them. This was one of my favorite cards. I told you I love this set! I will be so sad when it is gone in another month. This card was made with Basic Grey for the card base. It measures 6x6. THe Basic Black layer is 5 3/4" square. Finally the Purely Pomegranate layer is 5 1/2" x 5 or 4 3/4" (I forget the exact measurement). I stamped the Flower Garden stamp in Basic Grey on the Pomegranate CS and then on a piece of Whisper White. The white is about 2x3". I watercolored the flower on the white cs with my Aqua Painter and the classic ink pads of Wild Wasabi and Purely Pomegranate and So Saffron. I then embossed it with Versamark and Glassy Glaze Ultra Thick EP. While the EP was still warm, I sprinkled in a little Dazzling Diamonds Glitter. To embellish this, I added some Rub-ons and some Purely Pomegranate Double Stitched ribbon tied through a piece of Pewter Hodgepodge Hardware. Also, since the current Aged Copper, Antique Brass and Pewter Hodgepodge Hardware is going to be retiring at the end of this catalog, Stampin' Up! is putting it on sale for 25% off. This special is going on until August 10th. E-mail me today to get yours before it is gone forever!